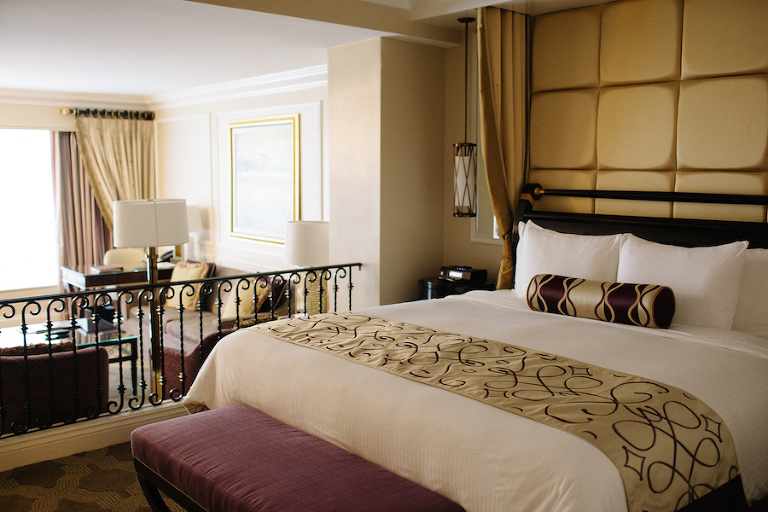 *The Venetian sponsored our stay in Las Vegas. All opinions are the author’s own and are not endorsed by sponsor. With the lights and excitement that is Las Vegas; it was so refreshing to enjoy an Aisle Society girls trip to The Venetian and its sister property The Palazzo. This was my first trip to Sin City, so I truly had no idea what to expect. Italy is one of my favorite countries, so I knew it would take a lot to impress me, but the moment I set foot into the The Venetian’s lobby, I was immediately in awe. The architecture, the gold statues and the grandeur of the hotel will definitely make you pause! Those moments of anticipation between check-in and setting foot into your room for the first time can sometimes be nerve racking. 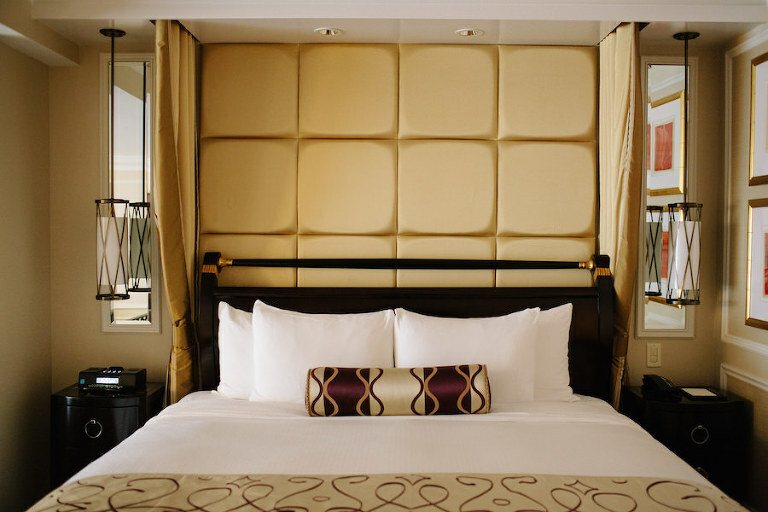 However, at the Venetian you feel like you received an upgrade, because all of the guest rooms are suites, making them some of the largest on the strip! 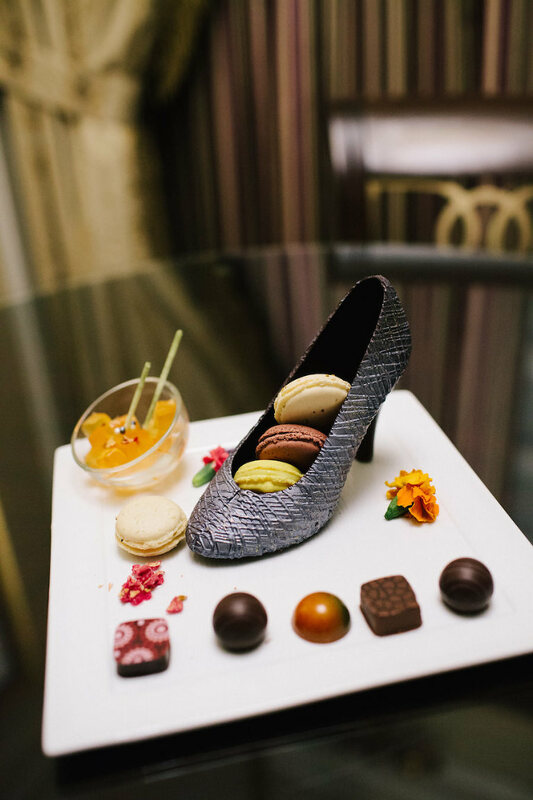 My favorite details of room included the three tvs, the huge bathtub (plenty of room for two), the motorized blackout blinds and the high heel chocolate shoe and macaron welcome gift. I must admit, I couldn’t bring myself to eat it; it was just way too pretty! 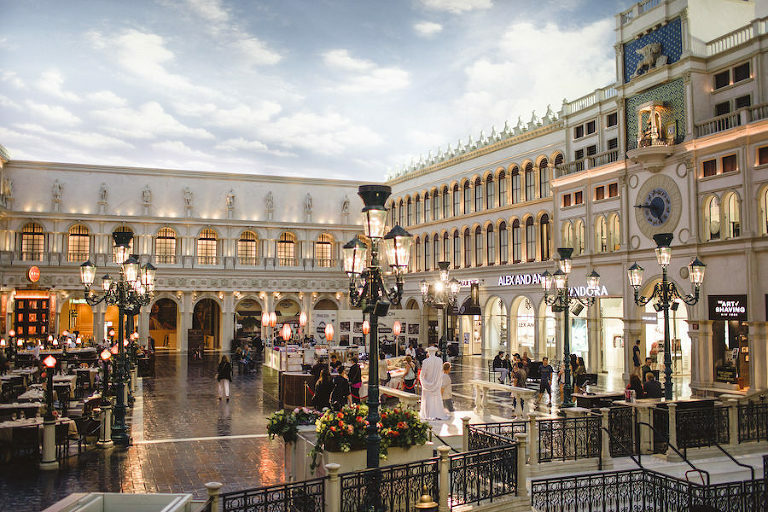 If you love to shop (or even window shop), then you and your girls or wedding guests definitely want set aside an afternoon or two strolling the Grand Canal Shoppes. With over 200 dining and retail options, including a Sephora, within the hotel, you don’t even need to set foot outside. 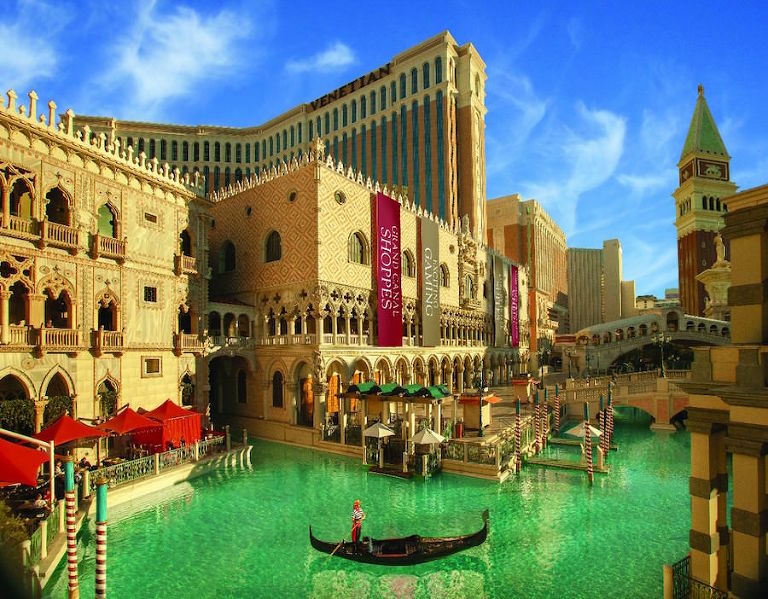 You cannot visit The Venetian without enjoying its iconic gondola ride. With the attention to detail and the surrounding architecture, you truly feel like you’re gliding down the waterways in Venice. The sky painted ceiling is breathtaking and truly brings the outdoors in. Watch the Aisle Society girls enjoying their relaxing ride. Whether you want late-night dim sum, contemporary French cuisine from Chef Daniel Boulud’s db Brasserie, family style Italian at TLC’s “Cake Boss” star’s Buddy V’s Ristorante, (my personal favorite) or a sweet treat his Carlo’s Bakery, you can have your cake and eat it too with almost 70 restaurants located within the Venetian. The Aisle Society girls and I got a behind-the-scenes look at Carlo’s Bakery, the in-house wedding cake baker. How cool would it be to have a Cake Boss dessert at your big day?! Venetian weddings feature unique, upscale, romantic settings ranging from an indoor chapel to a private white gondola with a serenading gondolier. The Magnolia, Dahlia and Gardenia chapels allow for a more traditional, indoor wedding with the outdoor terrace and fountains framing the background, with seating for up to 150 if you reserve all three spaces. For couples wanting to get married outdoors, the Venezia Courtyard, one of the hotels grandest venues boasts a regal altar on its rooftop deck, surrounded by lush gardens, the pool and fountains. The adjacent outdoor terraces offer more intimate locations for smaller groups. For those couples looking for a unique wedding venue, The Venetian features The Bridge of Love, which transports your ceremony space to an Italian square. This bustling location makes you feel like you saying your “I Do’s” in and outdoor European city. Keeping within the Italian theme, couples can even exchange vows floating down the waterway in a white gondola! If having a memorizing and colorful backdrop is more your style, the Palazzo Waterfall provides an enchanted setting. No bachelorette party or honeymoon should end without a trip to the spa. Just was with the shops and restaurants, everything is located under the roof The Venetian and Palazzo. The Canyon Ranch SpaClub boasts 134,000 square feet of relaxation and luxury, making it one the largest in the world. Their bridal suite provides privacy for your bridesmaids, while the salon offers hair, nails and makeup to make sure everyone looks their best. I was treated to an evening in the spa, and it was definitely one of the highlights of the trip. Even with the action that is Las Vegas, everything melts away in their wave room, which features stone zero gravity loungers and lighting and sounds simulating breaking waves. I must admit with the pampering, amazing cuisine and European influences, I was asking myself how soon can I convince my husband to host a vow renewal at the Venetian!